IowaDocs® (desktop) will not open – HotDocs freezes up at start up. When this happens it is most likely due to a corrupt library file. Below will discuss how you can fix this issue on your own. If you would like assistance please contact IowaDocs® Support at 866-597-6040. The instructions below are for a typical workstation install but the same procedure can be done with a network install – but you will need to know the root directory of where IowaDocs® is installed. Download the following zip file: files/restorelibrary.zip, once downloaded open it and run the exe it contains and follow the onscreen instructions. 3. 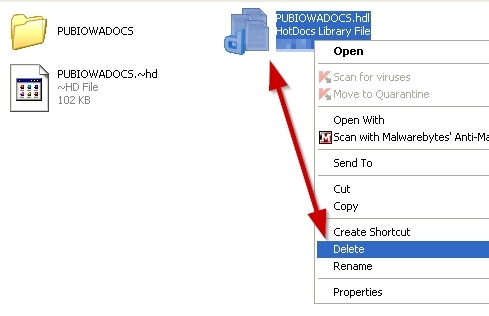 Right-click on the HotDocs Library File “PUBIOWADOCS.HDL” and select Delete (see Figure 2 below). 4. Click on “Yes” to confirm deletion. 6. ONLY delete the last 3 characters “~hd” and replace them with “hdl” (last character is a lower-case L). Show you should have “PUBIOWADOCS.hdl” for a name. If you get a warning about changing the extension, simply accept it. 7. Now try opening IowaDocs® - if it opens you have fixed the issue. If IowaDocs® still doesn’t open then please contact IowaDocs® support at 866-597-6040.